Today I’m glowing. I’m basking in yesterday. Today was a great day, don’t get me wrong, but part of the reason today was so good is because yesterday was simply superb. It was a day of absolute beauty. All day I felt God’s smile. Lovely. The day started out normal enough with Christina and I heading to Romaniv with the rest of the crew. But Romaniv. Oh Romaniv. We had the BEST time. Yesterday was hands down my favorite day at Romaniv yet. No comparison. It’s hard to say just what made it so special. I think part of the goodness was that we are simply getting to know the boys more. We are there consistently and it’s beginning to pay off bit by bit. We know them all by name, some who are able can recognize us. We are starting to get in to a bit of a rhythm with our little team. We are learning some of the specific needs of each of the boys and when we are able, we meet those needs. I had the most beautiful moment with one of the boys, Vova. I’m supposed to save this for our series about Romaniv but I can’t hold it in. You can read about it twice. 🙂 So Nina brought bubbles yesterday. That’s the first time we’ve attempted bubbles with the boys. It was AWESOME!!!! A few of them loved it!!! Total success. Anyway, after playing with bubbles for a bit I decided to take one of the bottles of bubbles and go to the bedrooms to see if some of the boys who don’t come to play would enjoy them at all. I went in to the first room and found one boy asleep on the floor, one boy asleep on the bed, and Vova sitting in his bed rocking back and forth. He was self stimulating, banging his hand on his leg repeatedly as he rocked. I said his name and knelt on the floor below him. Slowly I started blowing a couple bubbles. Instantly he stopped stimming (self-stimulating). He sat still for a moment and I blew a couple more bubbles. He remained still and quiet so I kept on blowing, quietly and slowly, more and more bubbles. Then, after a minute or so Vova slowly reached his hand up and started popping bubbles on by one. He popped some in the air, a couple on his leg, on his bed. He noticed the small wet spot left by a popped bubble and rubbed it with his finger. I spoke softly to him a bit, but was mostly just quiet as we played with the bubbles for a while. After several minutes of fascination with the bubbles he lifted his head and looked in my eyes. He looked at me, and just kept on looking. Melt my heart and make it burst all at once!!! I’ve never had eye contact like this with Vova before. He is normally distant and doesn’t participate at all in our time on Fridays. Then there we were, at his bed, looking at each other. I swear to you he almost smiled. It was magical. I felt the smile of God and His presence so strongly in that moment. I don’t even have words to describe it. Tears were running down my face as we looked at each other. Then Vova looked away and I resumed blowing bubbles. In that moment of connection I saw Vova in a different light. Normally I think of him almost as an old man. He walks unsteadily, legs bent at odd angles, not interacting with anyone. He often shrugs away from touch. I don’t know if he is verbal at all. Head shaved and nondescript face, but not yesterday. I saw him as a young man yesterday. I feel almost like I had the tiniest glimpse of how God sees Him. He was beautiful and valuable and precious. I will never ever forget that time. It fills my heart with hope for what God has in store. That verse is for Vova. That verse is for Misha. That verse is for Bogdan and Vladik and Valera and Zhenya. And because we believe that to be true, we have hope. I got back home from Romaniv, and as I walked around the corner to our house I saw the kids talking to our neighbor!! Our neighbors are like total mystery people. We doubted their existence, so rare were the signs of life coming from their home. Our building is actually made up of 6 “apartments”. It’s hard to explain and hard to even tell where the different apartments start and end. Well, finally I met one of our neighbors! Not only that, but she was nice! And she has a 2-year old! Seth and little Vitaliy played trains while we two Mommies attempted conversation. We managed to visit for an hour!! OMG. HUGE breakthrough! I could have burst I was so happy to have a neighbor connection with an actual human. Woot! Thank you Jesus and thank you Google Translate. 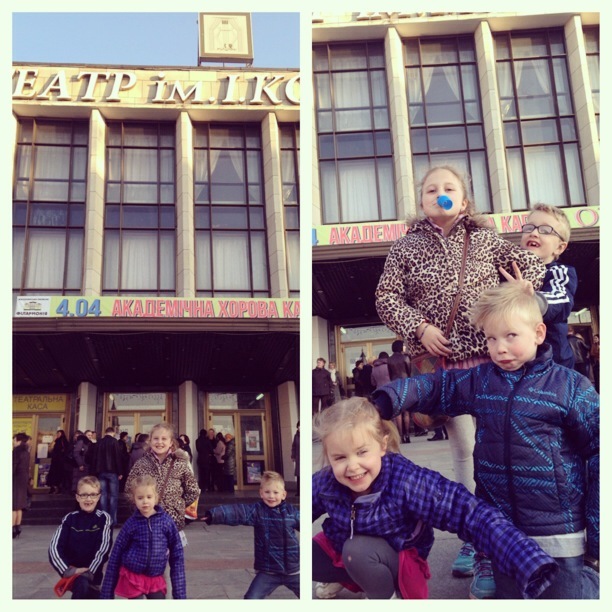 Then to wrap up the most fantastic day ever, the kids and I (Jed was in Kyiv) went to a concert at our local theater with some friends. We listened to a local Acapella choir that is famous throughout Ukraine. It was absolute heaven. They were beautiful. I can hardly wait till their next tour. You guys, it was such a treat. They sang old traditional Ukrainian songs, songs in Latin, a fun song in English about springtime love, and even an old spiritual that I sang in high school choir! Now that was a kick. During the English song Ezra leaned over and said “Mom, this sounds a lot like English!” “Yes, that’s because it IS English my boy.” Haha! They sang a tribute song to “Heavens Hundred”, the people who died on Maidan in February- ordinary people who gave all so their country could have a future. Everyone stood while they sang, many people were crying. It was a moment I’ll not soon forget. The spirit of the Ukrainian people is astounding. In the midst of occupation and threat of invasion at our borders, they steal away on a Friday night to partake of beauty and honor their heroes. At the end of the concert the singers and the audience cheered “СЛАВА УКРАЇНІ!” (“Glory to Ukraine!”) You could see the pride in their eyes. So there you have it; my yesterday. My heart is full. Here is a video tribute to the Heavenly Hundred. The song in this video is the song we heard sung last night. May God bless Ukraine and may their deaths never be in vain. Heart lifting blog! I will be in Zhitomir in two weeks time, can’t wait! Hey there! Are you here in Z town now? This is beautiful! Our family has been praying for your family! Just when we need it, Jesus comes in with exactly what we need to make our hearts soar and rejoice in His love for us and others. So amazing. So inspiring-what your doing! Oh Gabby, thank you so much for praying!! Your connection with Vova, through the bubbles, was very cool Kim! Keep up the good work!